So, it's under construction, but behold, the new gallery! Lots of work to do, but I figure I'll start by uploading pictures. Eventually you'll see some of my favorite galleries from imgDump preserved for viewing. For starters, a meager start to Heroman! Read more about OR Gallery... a preview! The latest Twitter meme started by famed @OpieRadio is sweeping the Twitterverse faster than an egg in transwarp. #JesseVenturaBelieves chronicles the factual beliefs held by a one Jesse Ventura. Jesse Ventura, pretty much completely unknown outside of America, is an ex-professional wrestler turned politician turned conspiracy kook. He currently wastes natural resources for network television channel TruTV. His show, Conspiracy Theory with Jesse Ventura features top notch investigative journalism as Ventura hunts down the truth behind the world's greatest conspiracy theories. Network executives reportedly signed off on the show commenting that Operation Repo wasn't unbelievable enough. Well, the time has finally come. imgDump will become a memory of internet past. Why you ask? The cost. Since our big server jump a year ago it's cost me around €25, ad revenue only brings in about €7, monthly. At the end of this month that price is slated to nearly double, something I can't keep supporting from my pockets anymore. Thus, it must come to an end, but we will have a swan song. There are two things I'm planing if I can sort the logistics. 1. Per requests I will archive and upload individual galleries for fans to download mass. If you really like [obscure anime] then soon you will probably be able to shoot me an email and I'll follow up with an archive. I kept imgDump going for so long because I believed everyone should have free access to the images, let's keep that alive a bit longer. Has Verizon Wireless pulled an AT&T with their blocking of 4chan? Over the past 72 hours, we've been receiving reports from Verizon Wireless customers having difficulty accessing the image boards. After investigating, we found that Verizon is dropping traffic to/from boards.4chan.org, only on port 80 (HTTP). No other subdomain/IP/port is affected, which leads us to believe this block is intentional. A call was placed to their support staff last night, and we were told that the ticket would not be looked at until Monday at the earliest, and: "You'll need the customer to call to request it be unblocked..."
If you've been affected by this block, please contact Verizon Wireless customer support. The numbers we were given are: "Verizon Wireless NRB: (866) 298-5373" and "Verizon Wireless DSO: (800) 770-1179". Note: Users with mobile browsers that proxy (BlackBerry, Opera) won't necessarily have issues accessing the boards. Ghost in the Shell 2.0 (Blu-Ray) only $10.99! I don't have a Blu-Ray player yet, waiting on a good PS3 deal, but I'm going to snag one of these for later. Read more about Ghost in the Shell 2.0 (Blu-Ray) only $10.99! 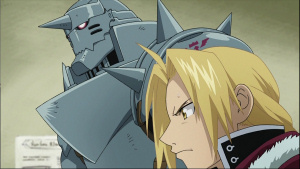 Time for my preview of this past weekend's FMA: Brotherhood release, episode 34. Of course, spoiler free. Mike has described this episode as the best since Lust vs. Roy. Granted, he has a hard on for the General. Opie and Anthony 'are no longer needed' at 92.3 K-ROCK in NYC as terrestrial radio drives another nail into its coffin. For the first time in nearly 30 years, New York now has a choice for hit music," said Theodore. "With 92.3 NOW FM we're breaking the mold of the traditional radio station and creating a pure multi-media companion for today's music fans. First off, my apologies if your accounts are missing in action. A clean copy of the DB was made a few weeks ago, edits were made against that copy, and was used for this version of the site. If you registered at the old site between then and now your account no longer exists. Please register again. - Adult Content behind approval button. Okay, probably not the best title for it. From now on you don't have to become a registered user in order to view adult content! - New Ads. Maybe not the most awesome feature, but they help pay for the host. - Thumbnails that show you the images before and after the one you're viewing. - Nifty little news mod to help me pass around important notices.